- Add knights, archers, sheeps, trees, rocks and flaming balls to the level. - Move, rotate, resize and remove objects and NPCs on the level. 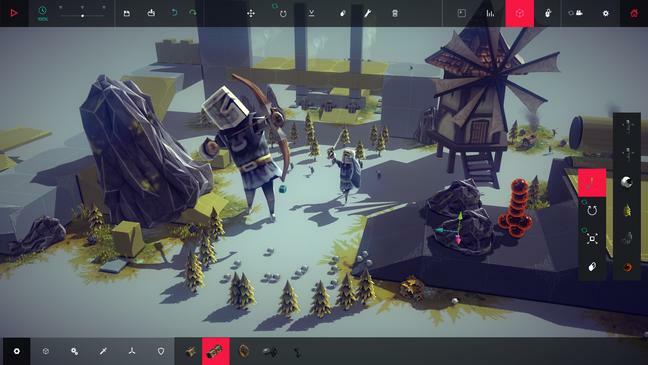 Copy the downloaded file to \Besiege_Data\Mods in your Besiege folder. spaar's Mod Loader must be installed. ITR It's a completely built-in hidden feature. This mod just activates it. You should make a warning, that it could be unstable. Since the devs haven't released it, but already coded two or so classes for it, there is a chance that it's not ready to use. Also, I don't know much about licensing, but you should make a hint that your mod isn't this editor, but activates it. Any game modification can be unstable of course, there's no need to even mention this. I'm confused :c Spaars mod loader has been installed and the mod has been placed in the mod folder that I created but it does not seem to load? :/ How can I be sure that spaars mod loader has been installed correctly? are there any visible changes? Press Ctrl+K or Ctrl+O. If the modloader is installed, gui windows will appear. It's the modloader that causes lags actually. Is there a function to save the level or is that not implemented yet? Mhh. Normally the mod loader itself shouldn't cause any lags. Zimmy, I'm glad that you found this little Gem in the game. Must have been a very random discovery. I would greatly appreciate a way to save level changes. There is no such function in the game, unfortunately. You could do it like it's done for the machines. But since the developers will add that function there is currently no need for it. any chance we could get a button to activate the level editor and deactivate it so that the GUI for it went away and you were sure when you were using your tools or the mod?